At first glance the Motorola V360 seems like a pretty typical compact clamshell phone - but the impressive thing with the V360 is that it squeezes in so much high-end technology into a such a great value package. There's a large 176x220 pixel display on the inside, and a VGA resolution camera on the outside but there's a lot more to the Motorola V360 than that! 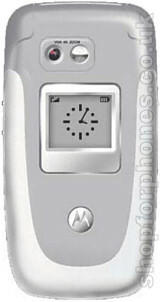 The Motorola V360 can also play back MP3 audio and MPEG4 movies, supports PTT (push-to-talk), has a web browser and email client, comes with a 24 channel, 22KHz polyphonic speaker for excellent audio playback and also supports TransFlash memory cards, taking the V360 up to a maximum of 256Mb which is enough for plenty of media clips. On top of all this, the Motorola V360 has Bluetooth, Java and supports Motorola's new "Dynamic Idle" zero touch information system. The V360 manages to fit all this into a 104 gram handset measuring 90x47x24mm with a neat internal antenna. Coming Q4 2005. Please subscribe to our newsletter for updates. If you want more information on the Motorola V360, subscribe to our mailing list. Also, the Update newsletter contains general news about new phone releases.